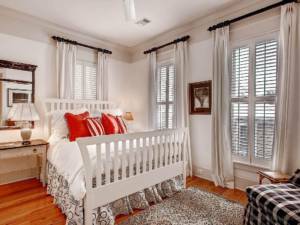 We are Stayin’ For Keeps in this perfectly located cottage in Seaside, Florida! Sitting pretty on Seaside Avenue, this charming beach cottage is a short walk from the Seaside Town Center, the beautiful emerald waters of the Gulf and three community pools, the park, tennis courts and playground. The spacious upper and lower porches are reminiscent of a Greek Revival plantation home. Relax in the grand family room featuring a fireplace or pick out the perfect book for the beach in the library. The kitchen is the perfect place to gather. 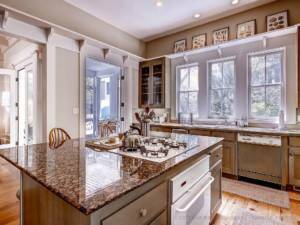 A large island with bar stools and a dining room with seating for 10 offers both casual and formal dining areas. Comfortably sleeping 12, this 5BR/ 5.5BA home has features four bedrooms, all with private bathrooms. The bunk room is complete with two sets of bunk beds and its own bathroom as well. A spectacular staircase rises from the center of the home all the way up to the observation tower. Enjoy a 360 degree view complete with window seats and breathtaking views of the Gulf of Mexico. Once you visit this luxury vacation home, you will ‘keep’ coming back year after year.